VIPAccessEXCLUSIVE: Ser’Darius Blain Interview With Alexisjoyvipaccess At The Dee Dee Jackson Foundation’s Celebrity Softball Game! It goes without saying that any project that the remarkable Ser’Darius Blain is a part of is always bound to be magnificent. Ser’Darius Blain is a familiar face in an endless amount of brilliant projects and it always gives us the greatest joy to see him on both the big and small screens. Ser’Darius Blain has such a natural and effortless talent for acting and he truly stands out in the entertainment industry as one sensational actor. We’ve seen the exceptional Ser’Darius Blain in highly-acclaimed projects including the blockbuster hit of a movie, Jumanji: Welcome to the Jungle, as well as other projects including Footloose, Jane by Design, Survivor’s Remorse, Shameless and many others. With everything that he works on, Ser’Darius Blain puts his 150% passion into it. Any and every role comes at such an ease for an actor as terrific as he is. Ser’Darius Blain continues to keep busy with many more excellent projects. He joined the cast of the much-anticipated reboot of Charmed and it was just recently announced that he booked a role in the film, Against All Enemies. Ser’Darius Blain is definitely taking over the entertainment world by storm and we can’t wait to see all of the other marvelous projects he has in store to share with all of his fans. 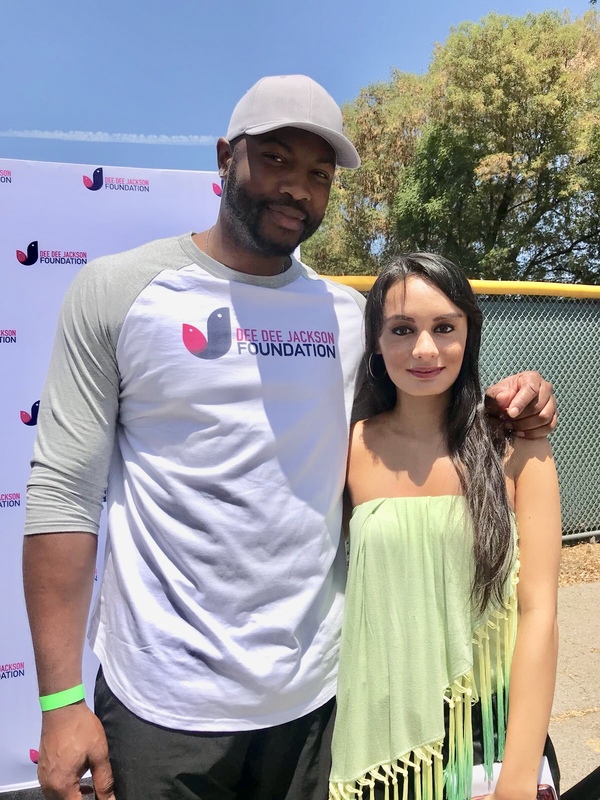 I, Alexisjoyvipaccess had a fantastic time covering the Dee Dee Jackson Foundation’s Celebrity Softball Game and had a great time catching up with and interviewing the amazing Ser’Darius Blain again at the event. Ser’Darius Blain dished exclusively to Alexisjoyvipaccess all about working on the Charmed reboot, his upcoming film, Against All Enemies, what his reaction was like when he found out that Jumanji: Welcome to the Jungle was nominated for all of its awards at the Teen Choice Awards and so much more only in our VIPAccessEXCLUSIVE updated interview. Ser’Darius Blain even showed us his best softball pose / stance – see it for yourself in our VIPAccessEXCLUSIVE updated interview below. Thanks for another fun interview, Ser’Darius! Check out my VIPAccessEXCLUSIVE updated interview with the spectacular Ser’Darius Blain at the Dee Dee Jackson Foundation’s Celebrity Softball Game below! Previous VIPAccessEXCLUSIVE: The Phenomenal Adam McArthur Talks All About “Star Vs The Forces Of Evil,” Martial Arts And Answers Fan Questions In His Interview With Alexisjoyvipaccess! Next VIPAccessEXCLUSIVE: UFC Legend Chuck Liddell Interview With Alexisjoyvipaccess At The Dee Dee Jackson Foundation’s Celebrity Softball Game!